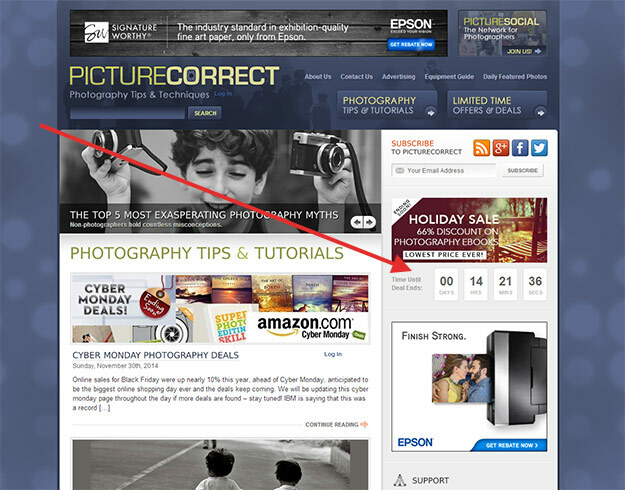 Picture Correct is a popular photography blog that publishes tips, tutorials, and inspirational posts. 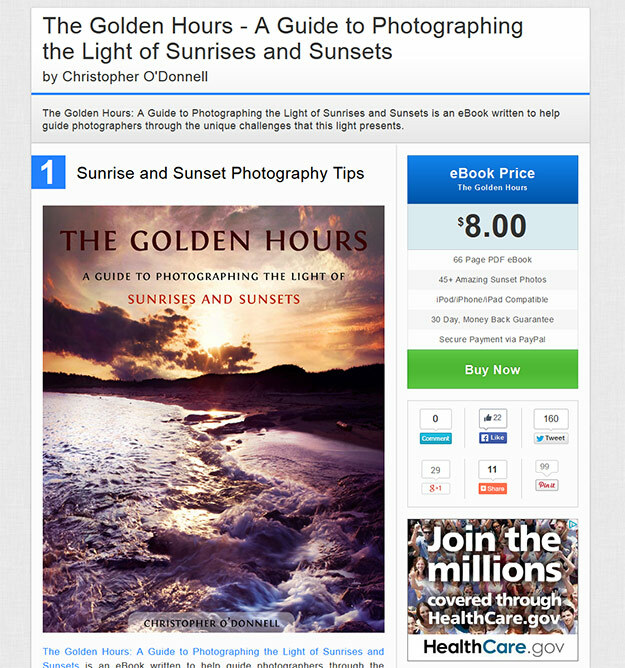 One of the ways this blog makes money is through the promotion of limited-time deals for photographers. Daily deal sites like Groupon are obviously very popular, and even within the photography industry there are several Groupon-like sites that offer limited-time deals on products specifically for photographers. Picture Correct uses a similar approach, but leverages its blog audience and traffic to get plenty of exposure for these deals. At the top of the sidebar at Picture Correct there is a promo for the current deal. 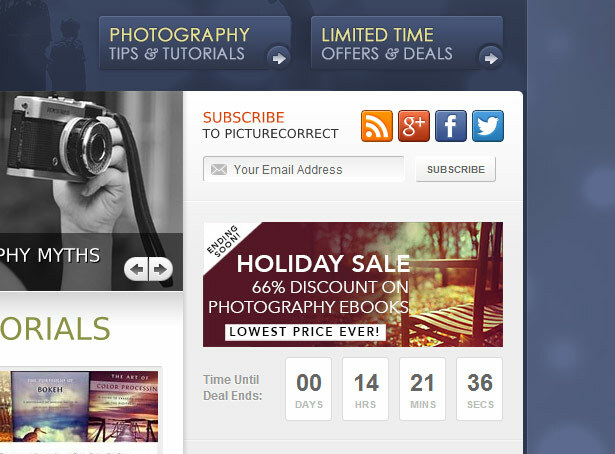 It includes a banner graphic and a timer that is counting down until the deal expires. You can see exactly where the promo area is located in the screenshot below. And you can see it in better detail in this screenshot. When a new deal is added they also publish a blog post to announce the deal, and that post goes out to a very large list of subscribers. These deals that are promoted at Picture Correct are on products from other companies and websites, rather than products created by Picture Correct. Sometimes the deal description will include an affiliate link and a coupon code that the buyer needs to use to get the discount, and other times the sale will actually be processed at Picture Correct for the discounted price. The blog has a very targeted audience of photographers. This includes new visitors arriving at various blog posts each day, as well as email subscribers. There are a lot of companies with products who are interested in reaching this audience, so there are plenty of opportunities for Picture Correct to line up great discounts. The top of the sidebar location provides good visibility, and the count down adds a sense of urgency to get visitors to take action. It’s also common to see a promo at the bottom of posts on Picture Correct to draw even more attention to the current deal. The posts announcing new deals receive plenty of exposure thanks to an established email list, and the email list is promoted heavily on the site through a pop up. If you are looking for a way to boost your affiliate revenue, partnering with vendors to offer limited-time savings is one option that can be very effective. You’ll need a large enough audience to generate sales and to make the sales volume worth it for the vendors to agree to the deals. If you have a targeted audience and vendors who are interested in reaching that audience, some creativity will lead to plenty of opportunities. Buyers respond to limited-time offers. A large email list can be extremely valuable even if you don’t have your own products to sell to your list. Affiliate marketing doesn’t have to limit you to typical promotional methods like links within blog content and product reviews. 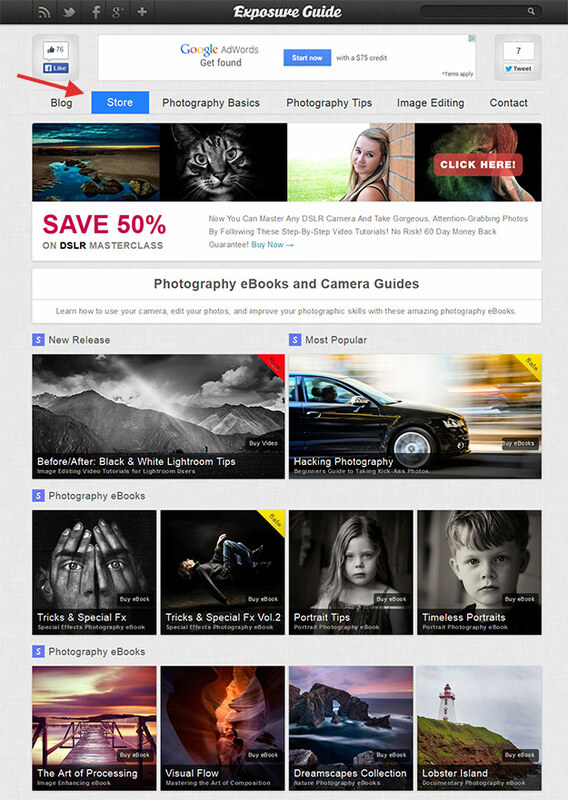 Exposure Guide is another photography blog that takes an interesting approach to affiliate marketing. The second link in their main navigation menu is “Store“. When you click on that link you’ll find a store page that features about 50 different e-books and courses that teach all different aspects of photography. When you click on any of the items you’ll be led to a product description page that is fairly typical from an e-commerce store. You’ll see some product images, a detailed description, and a button to buy the product. So far this seems pretty typical for an e-commerce site, but what makes this unique is that Exposure Guide is not selling any of their own products. The “buy now” buttons are affiliate links. Exposure Guide is proof that if you want to set up a store on your site or blog you don’t need to have your own products. You can use a more typical store setup to promote products as an affiliate. This could easily be duplicated in other niches and industries that have a number of different affiliate programs to join. One of the challenges in setting this up may be the technical details. Chances are your blog theme will not allow you to create a nice Shop page like the one at Exposure Guide. However, there are several different WordPress plugins, like Thrive Content Builder, that allow you to design your page with a drag-and-drop editor. This makes it possible to get the layout that you want for your shop without changing your theme and without hiring a designer/developer to do it for you. The store has high visibility because of the link in the main navigation menu. Products are also promoted at times through blog posts and in the sidebar. The detailed descriptions on the product pages should make it possible to get search engine visitors directly to these pages. The product pages also pre-sell visitors even before they click on the affiliate link. Once the shop is set up it should be relatively low maintenance while still producing income. As long as the products remain available and relevant they can be left in the shop. Setting up a store page on your blog can help to give some organization to the products that you want to promote as an affiliate. You can still promote them in your post content, but the store page makes it easy for visitors to see what is available. Affiliate marketing can be done effectively with the appearance of an e-commerce site where you would be selling your own products. 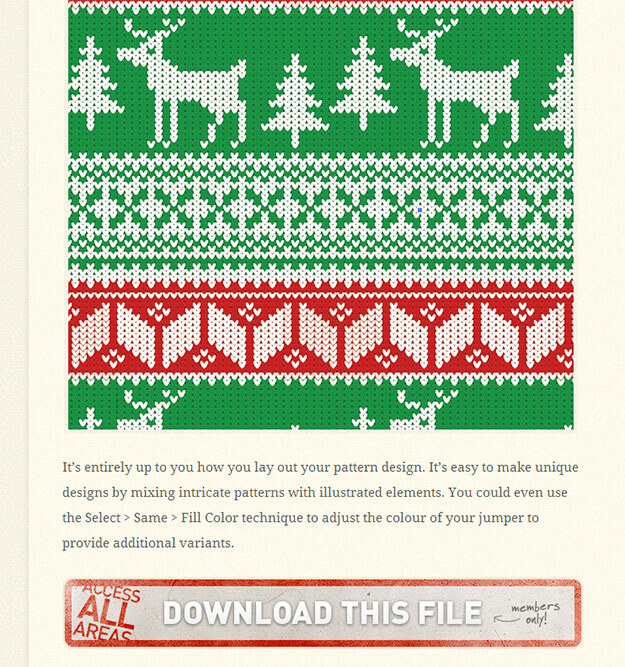 Blog.SpoonGraphics is the popular blog of graphic designer Chris Spooner. One of the ways Chris monetizes his blog is through an “All Access” membership. 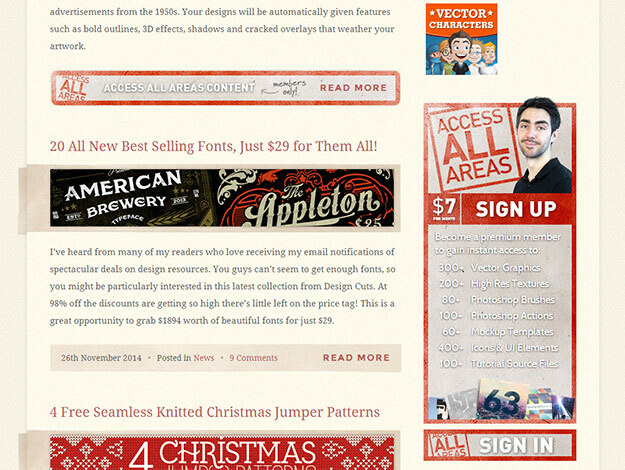 The membership costs $7 per month and members get free design-related resources (like Photoshop files), as well as the ability to download source files that Chris uses in the tutorials on the blog. The membership is promoted in the sidebar, as well as within content and below content. One of the reasons Chris’ blog is so popular is because he publishes high quality tutorials showing readers how to create various designs in Photoshop and Illustrator. Anyone can follow along with the tutorials for free, but with the All Access membership you can also download the Photoshop of Illustrator files that Chris used while creating the tutorial, which can be really helpful for learning. Chris also partners with a lot of different vendors to offer valuable freebies to his members. The vendors provide something of value to Chris and the members, and in exchange they get some free promotion and a link from his blog. The end result is that a $7 per month membership can be a great value for someone who fits well into Chris’ target audience. The membership model is nothing new, but what I think makes Chris’ membership interesting from a marketing perspective is that it doesn’t tie him down and require him to spend loads of time or money maintaining the membership aspect. Since he already writes the tutorials for his blog, offering the source Photoshop and Illustrator files takes very little extra time, all he really needs to do is set up the protected download link for members. And since most of the members-only resources are coming from other vendors he does not have to dedicate the time to design and create it himself. He may pay some of those vendors for use of their products, but I’d imagine he gets most of it for free in exchange for the promotion that it gets as a result. He established his reputation in the industry before launching the membership aspect. Readers love his work and trust him enough to sign up for the membership. The tutorials that he publishes on the blog promote the membership because readers will see that if they join they can get access to the files used in the tutorial. Membership offers something additional to readers who come to his blog on a regular basis to follow the tutorials. Chris’ established audience makes it possible from him to get products from vendors for his members. Chris uses the Wishlist Member WordPress plugin for the membership functionality, but there are a number of different membership plugins that you could use to accomplish the same thing. Not all membership sites require a lot of time and money to maintain. Integrating a membership upgrade option with free blog posts is a great way to build a base of members. Establishing a strong reputation within your industry makes it possible to monetize your blog in a variety of ways. WPLift is a blog that covers all things related to WordPress. They publish news, tutorials, and round up posts. One of the primary monetization methods for WPLift is affiliate marketing, and that makes a lot of sense since there are so many affiliate programs for WordPress themes, plugins, and hosting. Although affiliate links are used in the regular blog content, WPLift also uses a coupons directory to put a unique spin on it. 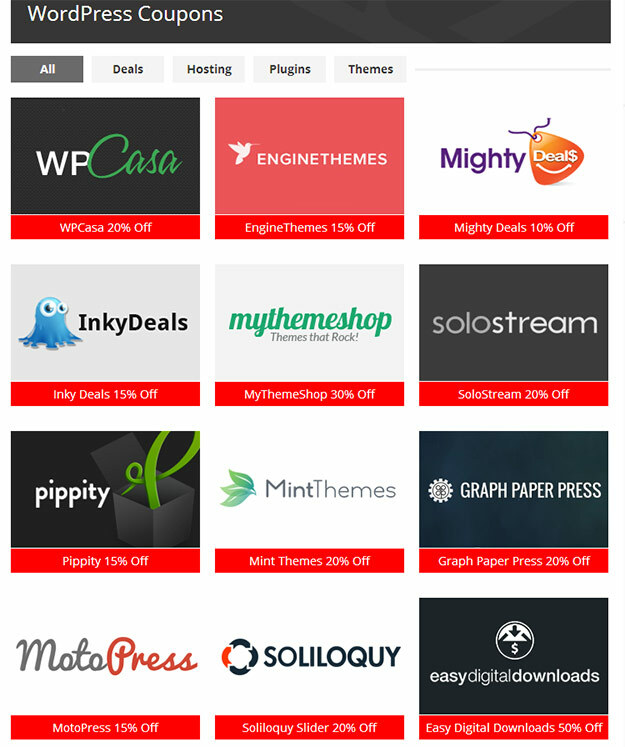 If you visit the Coupons section of WPLift, which is one of the links in the navigation menu, you can find many coupon codes for things like WordPress themes, plugins, and hosting. WPLift has worked with these vendors to get the coupon codes for a special offer, and the link to the vendor is an affiliate link. Buyers benefit by saving some money, WPLift benefits from the affiliate commission, and the vendor benefits from the exposure to WPLift’s highly-targeted audience. Aside from the Coupons page, WPLift also makes use of paid directly listings for WordPress theme and plugin sellers. 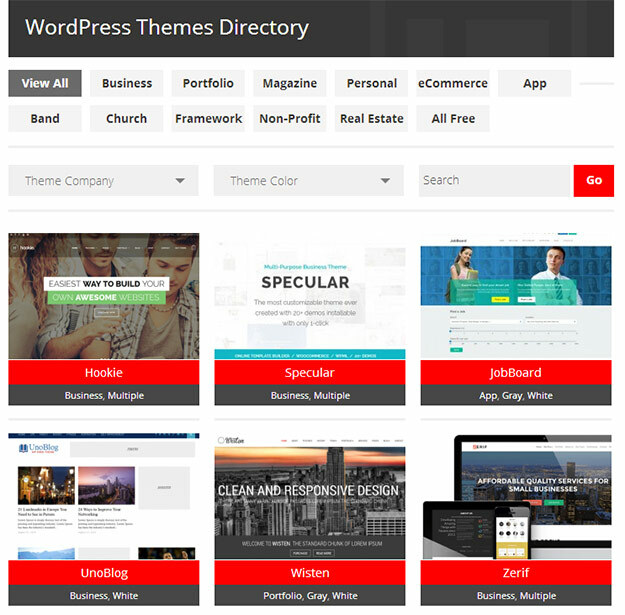 Anyone who sells a theme or plugin can get their product listed in the directory for $49. I’m counting over 130 themes currently listed in the directory, so if they all paid $49 to be listed that would account for well over $6,000 that has been produced from the theme directory alone. The pages have high visibility because of the links in the navigation menu. The coupons give buyers a reason to buy through WPLift’s affiliate links. WPLift has become a go-to source for WordPress information and resources, so sellers are willing to pay to have their products listed in the directory. I’d image that WPLift has strong connections with a number of theme and plugin sellers due to their influence in the WordPress community, so getting coupon codes and selling directory listings is likely much easier for them than it would be for a new player in the niche. Give buyers a reasons to purchase through your affiliate link, whether it be savings through a coupon code or some type of exclusive bonus. Paid directories can be very effective for authoritative sites with highly-targeted audiences. 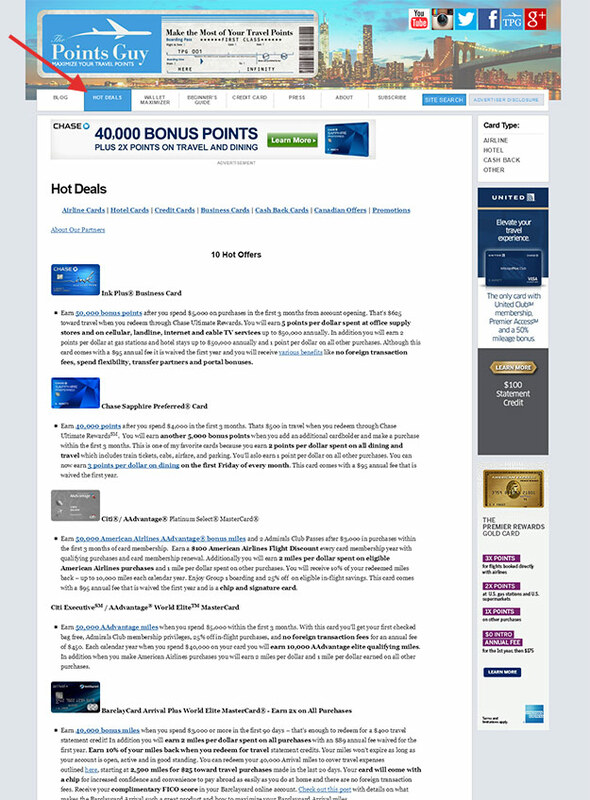 The Points Guy is a highly-focused blog that has become an authoritative source for news and reviews of credit cards with travel rewards and points. 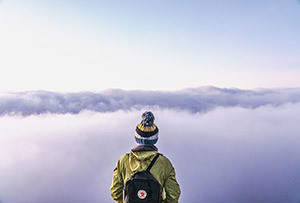 Rather than being a general travel blog like thousands, or maybe even millions, that are out there, The Points Guy focuses on just one aspect of travel and has become the go-to source. Many credit cards offer big payouts to affiliates, so this topic is not only useful for travelers but can also be highly lucrative for affiliates. Most of the blog posts at The Points Guy, and there are typically several posts per day, focus on news or alerts about promos for various credit cards, tips for how to best use travel rewards, and other highly-relevant topics. If you’re a traveler who is always looking to save money, following The Points Guy is a great way to stay up-to-date on the offers that are available. In addition to promoting affiliate offers and sponsored offers through post content, there is also a “Hot Deals” page, which I assume is one of the most frequently-viewed pages on the site. It is the first link in the navigation menu after the “blog” link. This page lists the top current offers and is updated so visitors can always come here to find great offers. Affiliate links and sponsored content aren’t really all that unique, after all, a lot of blogs are monetized in this way. What really makes The Points Guy unique is that the entire site has been built around one very specific goal of helping people to get the most out of travel rewards, and it so happens that affiliate payouts and sponsorships in this industry are quite high. The Hot Deals page presents all of the best current offers in one place, which is great for users and also great at generating income for the site. The topic of the site and the audience are highly targeted. There are a lot of affiliate programs and potential sponsors in this industry. The travel rewards offers are always changing, so there is plenty of news for the blog to cover on an on-going basis. The challenge of finding the best travel rewards can be overwhelming, but The Points Guy compiles a lot of information in one place making it easier for the user. The Points Guy has become the go to source on this topic. Becoming the go-to source in a highly-targeted niche with lucrative affiliate programs can produce a lot of income. Focusing on one specific topic rather than a larger overall industry makes it easier to become the go-to source. Not all affiliate programs require someone to buy a product in order for you to earn a commission. Most credit card affiliate programs, for example, pay for an approved credit application. My purpose with this post is not to tell you that you should be using your blog in the same way as any of these five examples. Taking a look at other blogs, even those in industries that are totally unrelated to yours, can help you to brainstorm and come up with some new ideas about how you might be able to make money with your own blog. The monetization methods that we looked at in this post mostly included affiliate marketing and membership, which are not really anything unheard of for bloggers. But these blogs have all taken an approach that differs a little bit from the typical blog using affiliate links, and this approach has been part of their success. All of the examples shown here have one thing in common. They all have a very specific target audience. If you have a specific target audience, once you are able to establish some traffic and build a reputation in your niche or industry, plenty of monetization opportunities will be available.